Spinning Rod / Reel Combination ? What is known to be a really good spinning rod ? and also reel combination ? no budget cap as I want to treat myself. Re: Spinning Rod / Reel Combination ? When I go spinning I use a 9' 6" uptide rod and of course a suitable fixed spool reel. 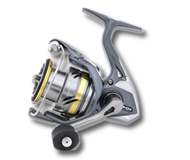 I would suggest a Daiwa Reel as I have found them to be very robust over the years. Some would say that an uptide rod is maybe a bit heavy but I have not found it so. It has enough power to cast a fair distance and enough grunt to handle something heavyish should you encounter say a large bass. Thus using a one ounce ball with a rubber eel around 18 inches behind it I have often had a decent bass in the harbour entrances on Hayling. Thought I would support my local fishing tackle shop " Christchurch Angling Centre " as these places cannot survive on bait sales alone. Ah right, now I would advise (in case you don't already know), picking a harbour entrance or estuary at the right state of the tide. E.g. when I lived in Exmouth a few years ago I would cast across the the Exe estuary at low water starting about around 1/2 hour before the turn of the tide. The bass would have to come down to that area at low water because the Exe almost dries out then. It never took me long to pull in a couple of decent size bass and after than I went home because once the tide got going they were back off up the river again. Hope this helps. HI eccles, thanks for that info, I have a similar entrance at Mudeford just out of Christchurch where I live known as the run. My first port of call will be the beach heading up to Hengistbury head then once there off the groyne. Really useful piece of information, Eccles. I have a very similar situation going where I'm at. I'm going to try this out. Great but no point in doing it until the water warms up a bit - say end of April.